Everything from glossy magazines and catalogs to directories and manuals. 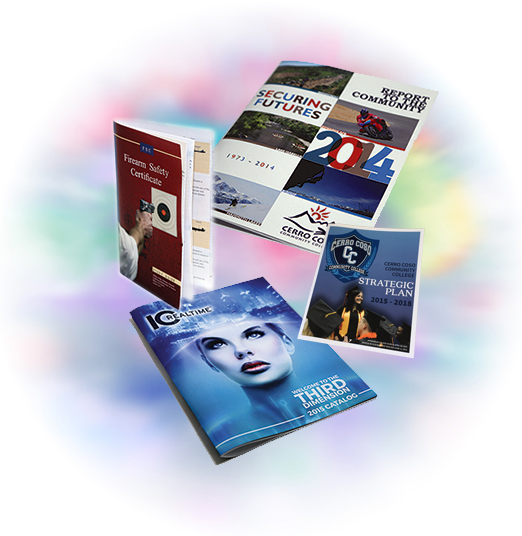 Our digital press can print and saddle stitch in the same operation avoiding additional bindery processes and costs. This means lower minimum order quantities and reduced setup charges compared to traditional offset printing processes. Our design department can design, set up and print your custom book today. Common sizes include 8.5" x 11" and 8.5" x 5.5" but other sizes are available. Standard stocks are 80 lb. gloss or smooth cover for the book cover and 80 lb. gloss or smooth text for the inside pages. Of course, other stock options are available. We also offer UV Coating on book covers.. UV coating is a liquid laminate applied just after printing and cured by UV lights. It is specially formulated to provide additional protection against sun fading, scuffing and abrasive scratching to your books. Comb bound, spiral bound or wire bound for finishing features are also available.